November 9 is when I invite our community and anyone else who feels compelled to join us, to celebrate International Day of Compassion. It’s a holiday I conceived in 2010; another small personal step toward peace, which evolved through my 9/11 Bowing Project. When this idea first occurred to me, I didn’t realize that November 9 was also the anniversary of Kristallnacht, the Night of the Broken Glass, a brutal night of terror, and the beginning of the end for so many victims of the Final Solution, the attempt of the Third Reich’s henchmen to rid Germany of the unwanted elements of Jews, Gypsies, Communists, and gays. It was also the beginning of the end for my two grandmothers, my aunt, my brother, and more cousins than I could count. None of whom I ever got to meet. That we must especially speak up against scapegoating anyone we perceive as the Other. The same way we practice compassion as we turn our fertility challenges into a source healing, we must also turn the continuous unleashing of hateful actions into a source of strength. Because light is stronger than darkness and greatest is the light that comes from darkness. Happy International Day of Compassion! Anything or anyone that needs a more compassionate response from you? like many of you, I, too know and feel that I need to be more compassionate with myself. Why does it seem easier to be compassionate towards other people than towards myself? And then, is it true compassion that I feel towards others…..I have often heard that you cannot really be compassionate towards other people if you are not capable of treating yourself compassionately, and it makes sense. There are days on this journey in which I truly feel compassionate towards myself, but there are others in which I can only see my mistakes, shortcoming, and guilt, anxiety, etc. all take over. Like others, I often find it harder to be compassionate towards myself. ‘You’re too hard in yourself’ people have said to me on so many occasions, and all too often I haven’t even ‘got’ that I’m being hard on myself, and actually think I’m being quite easy on myself! This year has been a really sticky one for me. While there have been no big dramas, I’ve felt overwhelmed by feelings of stuckness, and a deep feeling that a shake up is needed in my life, particularly with regards to my work, yet uncertainty about exactly what to do. Everything has felt kind of heavy, and the day to day life that a year ago I rather enjoyed, now feels like the wrong fit. ‘It’s no wonder you feel like this,’ one of my friends said, knowing about our almost 5 years of trying to conceive plus a few other challenges along the way. Yet I expect more of myself. I started re-reading a book called ‘Dark Nights of the Soul’ a few days ago, which describes these kinds of periods in our lives as a necessary part of the ebb and flow of life and that they are a stage on the journey to make us more of who we are meant to be. To shed old layers and bring us to the new territories we need to inhabit. So I’m trying to trust that the place I’m in is a necessary stage on my journey. As always, another insightful blog. Thank you Julia. There is no doubt that I desire more compassion toward myself. I find it far easier to be compassionate towards family, friends, my students, their families and even total strangers than being compassionate with myself. I work on it every day. My grandfather always used to tell me, “When someone upsets or hurts you, kill ’em with kindness.” It has been a valuable reminder for me to remember this, especially when someone has hurt me. I also desire to be more compassionate with my husband because this is OUR journey not just mine. I also desire to be more compassionate with my mother. She has suffered many traumas and just kept on going. Maybe together we can be more compassionate and heal as we journey forward together. There is always room for more kindness and compassion in the world, even by just taking small steps/actions. Baby steps toward healing, love and a better world. Another thought provoking invitation! My husband needs more compassion from me. 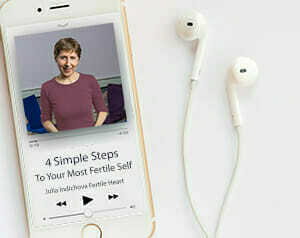 So much of the fertility journey is focused inward – on myself, on my body, what I put into it, what I need, when I need it. It’s exhausting! My husband, as kind, loving and supportive as he is, needs some more reciprocity from me. This is my body, but this is our journey, our project, our work in trying to achieve our end goal – our baby. I need to take what I’m learning about the UM in the OVUM practice and apply that outward towards my partner in a bigger way. Thank you for bringing me this clarity Julia. In addition, our world is in fact in dire need of compassion. The news breaks my heart on some level every single day. It seems like such an easy way to live – treat others with kindness, embrace differences among humans – after all that’s what makes us all special. However, this is such a difficult concept for this world to embrace. I can keep doing my small part to make the world around me a better place. There are always people and things that need a more compassionate response from me. Fruitbat, I appreciate your insight related to trauma. We are all on a journey with none of us perfect, some way more challenged than others. I often need to be more compassionate with myself, for instance for making mistakes at work. I often need to be compassionate with my husband and coo-workers for not responding to me in a sensitive way. Sometimes I am saying to myself in my head “Why are they doing that?” -forgetting momentarily that we just aren’t perfect. One thing that has helped soothe the angry voices inside my head quicker than most things I’ve tried is to , after someone has hurt me in some way, try to think of one good thing about them, even if it is just “I like your shoes”. I don’t necessarily say that to the other person, but the process of looking for that one good thing, hard as it might be, is very helpful. I try this even when I think someone isn’t being a courteous driver like “I like your car” or “your car is very clean. My pleasurable activity has been looking on Youtube for music people like to dance to and dancing to it. For me this question brings up the perhaps very obvious topic of trauma. Its one that my fertility journey has brought me to time and again to explore. It seems that despite thinking I have got to the root of things there is still more and more again. Slowly the trauma-scape has unwound and revealed new layers and then more. And with this there are gifts a plenty. I now can no longer put down the trauma lens and I am grateful to be wearing it all the time now. I now ask, just internally mostly, what happened to “them” for them to behave like this, say that, do that…? What’s their story? Because there is always a story right? Always. These cycles of violence don’t come from nowhere. And at times now I speak out. Its not that I want to excuse actions that are damaging and worse, its that I want to see the bigger picture, look for root causes and opportunities to heal and most of all I want to live in a society where we do this automatically at a societal and community level. Recently in the UK there has been a daily radio blog on a major news programme (BBC Radio 4 World at One) called The Adoption. Its a brilliant piece of radio and everyone has been incredibly brave to allow the following of an adoption process; it’s reported from the perspective of all involved. It’s been very sensitively produced. And still it is all too easy to feel angry with the birth parents, for the neglect of their children and worse that led to them being taken from them… And now with my trauma lens I can’t help but wonder what their stories are. What do their trauma-scapes look like? What took them to that place with their kids? And most of all I am very sad and angry that the best we have to offer as a wider community for them was parenting classes and the social work support. Not that these are not a good thing, I just think we could do better, we could turn up the compassion and curiosity and help more, deeper and longer and hopefully keep more families together. If we apply this wider perhaps we can better bring and keep communities together too.